Google Now gets you just the right information at just the right time. It tells you today’s weather before you start your day, how much traffic to expect before you leave for work, when the next train will arrive as you’re standing on the platform, or your favorite team's score while they’re playing. And the best part? All of this happens automatically. Cards appear throughout the day at the moment you need them. Get traffic conditions and alternate routes before you leave for work. Google Now also puts traffic to your next likely destination at your fingertips. 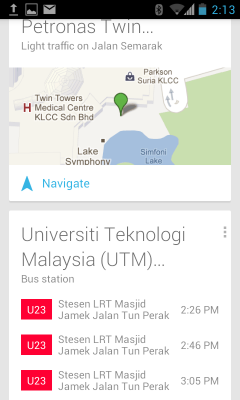 When you’re near a bus stop or a subway station, Google Now tells you what buses or trains are next. When you have an appointment, Google Now checks traffic so you can know how long it'll take to get there. You even get a notification for when you should leave. Google Now keeps you up to date on flight delays and traffic conditions to the airport for flights you've recently searched for. Google Now keeps you updated on your favorite sports teams in real time, with live scores and upcoming games. You can even can buy game tickets on the fly. When you’re on the go, Google Now will suggest nearby bars, restaurants, and places of interest. You can quickly jump to Google Maps to get more info, reviews, or even make a reservation. When you start your day, Google Now shows weather for your current location and work. Google Now helps you find just the right word when you're away from home. Use Google Now to quickly check the local conversion rate when you're traveling. When you're in a different time zone, Google Now shows you the time at home so you never feel too far away.